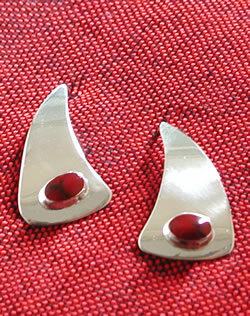 plato velo earrings Silverchilli - Beautiful fair trade sustainable silver jewellery from Mexico. Funky triangle drop silver earrings with coloured stone detail. Available in rich green, turquoise, jet black and fiery red. Handmade, fair trade and fabulous! These earrings are approximately 26mm high and 16mm wide.